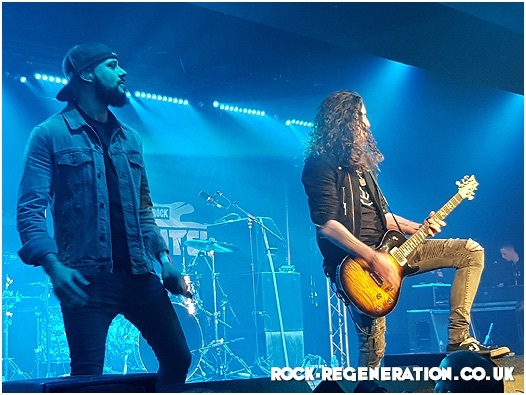 The UK’s premier Rock radio station ‘Planet Rock’ for the third year running, is set to take over Sandford Holiday Park in Dorset with the three day festival called “Winter’s End”. The festival features 25 well established and up-and-coming Rock acts, all under one roof over the course of the weekend. It all kicks off on Friday evening with Northern Irish four-piece the Screaming Eagles; who despite being first on, arrive with a confident swagger and some great tunes, which really gets the party started. The audience who made the effort to get in early are treated to a host of tunes that have a leaning towards AC/DC and a healthy injection of Belfast Blues. Next up are Manchester band Federal Charm, who continue the momentum with some impressive big riffs that easily fill this large hall. One of their standout tracks is a tune called “Can’t Rule Me” which features an interesting guitar piece that reminds me of Paul Weller’s “Sunflower”. The next act is Myke Gray who is known for performing in bands like Skin, Jagged Edge and more recently has released a solo album entitled “Shades of Gray”. 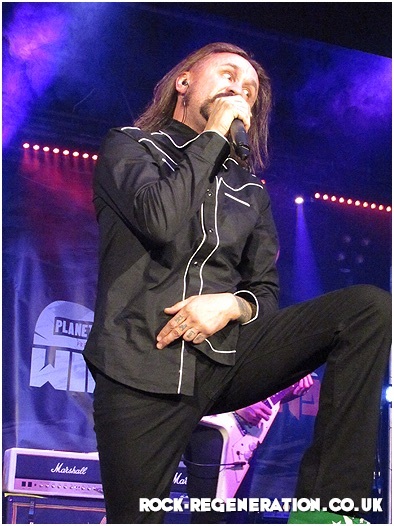 As Planet Rock DJ Paul Anthony introduces him and his band, the now much larger crowd gives them a huge welcome. You cannot deny after just hearing the first number that the band are on absolute top form and vocalist Kim Jennett shows off her fine vocals. This is further emphasized with her recent collaboration with Myke on the beautiful “Love like Suicide”. The set features many great versions of ‘Skin’ songs like “Take Me To The River”, “Look But Don’t Touch” and “Tower of Strength”, which gets the first audience sing-a-long of the night. The best is saved till last with the brilliant “Shine Your Light On Me” which leaves the audience feeling mightily uplifted. The next band caused somewhat of a debate amongst a few of us before they took to the stage. We discussed if a band features an original member are they a still a tribute band or a heritage band? We were not sure….answers on a postcard please! I must confess to not being a big fan of tribute acts or whatever they are called, but seeing Ricky Warwick and company bring back the music of “Thin Lizzy” in such a brilliant way I may have to alter my opinion. I was eager and open-minded to see what Brian Downey’s “Alive and Dangerous” had to offer. To say they impressed was an understatement; despite not playing “Whisky in the Jar” there were some excellent recreations of the big tunes like opening number “Jailbreak”, “Emerald”, “Rosalie” and of course crowd favourite “The Boys are Back in Town”. It was even great to see a few couples …. (no names mentioned) smooching to the emotional “Still in Love with you”. Day two starts at a nice leisurely pace, the facilities in this modern holiday park are fantastic with a great on-site restaurant featuring tasty cooked breakfasts with friendly efficient staff. My only gripe is that it took nearly 30 minutes to order a coffee from the Costa Bar, but the upside was the bar was open so I opted for an early beer. However, with a ten band day ahead to photograph and review I need to pace myself. They kick off at 11am with a feisty four-piece from Northern Ireland called Safire, who positively get things started with some high energy Classic Rock. Tim (Guitar), Cozy (Drums), Dean (Bass) and vocalist Saffron show us what they are made of, with tunes like the powerful “Heartbreaker”. 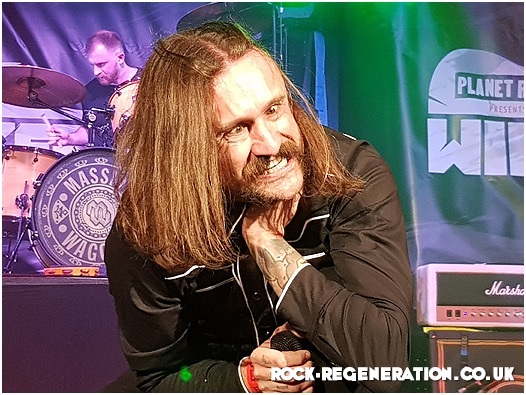 Dead Man’s Whiskey bound onto the stage with big bold tunes like ‘War Machine’ and their new single “Racing Bullet”, putting in a really impressive all-round performance which the audience really seem to warm to. Frontman Nico emotionally dedicates “Make You Proud” to his Mother who suffers from memory loss due to a brain tumour, and boy he belts out the tune with some beautiful passionately delivery vocals. Temples On Mars provide us with some lovely creative guitar work with their alternative style while Beau Bowen divide opinions with a set full of experimental styles. The first part of the day ends with Ryders Creed; a five-piece no-nonsense hard Rock band from the Midlands who light the place up with some great twin guitar work and some impressive vocals from frontman Ryan Hulme, who really whips up the Winter’s End crowd with some fantastic tunes including “My Life” and the rip-roaring “Raise The Hoof”. After a few hours break it’s time for the evening session and we have five more bands to rock up our Saturday evening. Xander and the Peace Pirates kick things off with something distinctly different. 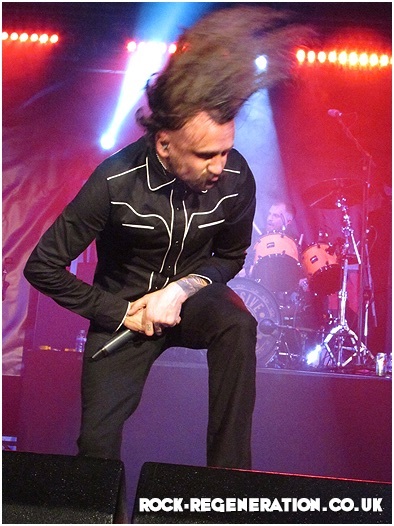 The band was formed in Liverpool by brothers Keith and Stuart Xander in 2014. 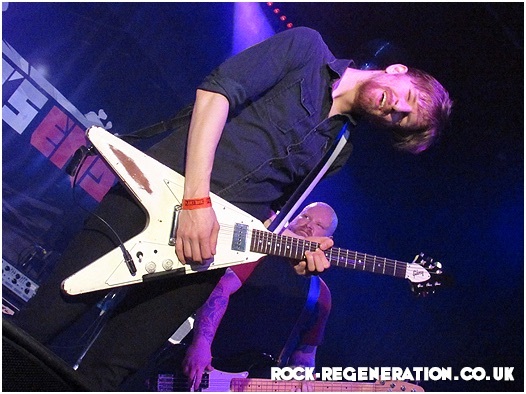 Keith does not have a right hand and plays his guitar amazingly with a prosthetic hook adapted to hold a plectrum. The five-piece band who combine acoustic and electric guitars lead us through a Blues-influenced set full of beautifully delivered, intricate guitar work that is just a joy to watch. Their tune “Dance with The Devil” is a lasting memory of their set; so refreshingly different and a nice contrast to anything we have seen, certainly one of the best performances of the weekend so far. Blackwater Conspiracy, another Northern Irish band are up next and after listening to their album “Shootin’ The Breeze” I was keen to see how they fared live. Their music is really Rootsy with an injection of Country and Blues; delivered with a good deal of Rock n’ Roll swagger, with plenty of influences from back in time and the modern day. You cannot but fail to be charmed by their piano-led tunes and low slung guitars. 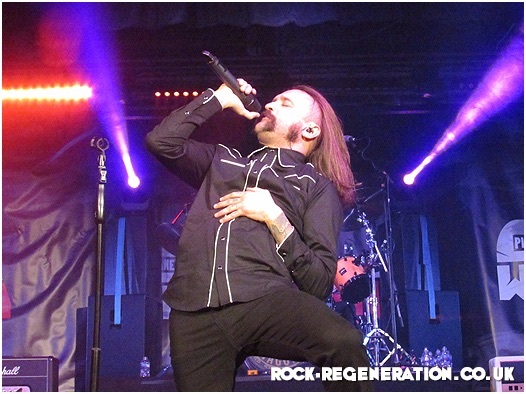 Their songs like “Hanging Tree” and the wonderfully written “85 Rockstar” really inject loads of positive enthusiasm into the crowd who willingly sing the lyrics back at the band. It looks like their second album is on the way as we are treated to some new material, with the reminiscing “Say Goodbye to Yesterday”. Bad Touch are one of the finest up and coming bands in the country today and seeing them on this bill is just fantastic, though following Blackwater Conspiracy is no easy task. Bad Touch take to the stage and get a huge welcome from the delighted crowd and after being together since 2010 their live reputation just seems to grow and grow. They of course have no problem in whipping up this crowd who willingly take in all the band deliver with their huge guitar sound; coupled with Stevie Westwood’s dynamic vocal delivery, which fills every inch of this hall. We are blessed with tunes like “Dressed to Kill”, “Good On Me” which is coupled with ZZ Top’s “Sharp Dressed Man” and crowd favourite from the album “Truth Be Told” “99%”. The penultimate band of the day is Kingdom of Madness; a band that has been put together by ex-Magnum keyboard player Mark Stanway, who sadly suddenly left the band after a disagreement. I have personally been a huge fan of Magnum since seeing them on the “Vigilante” tour in 1986. To hear these songs without Bob Catley and Tony Clarkin at their heart is not going to be easy. The band organise themselves on stage and look a little like session musicians recording an album. With vocals by Chris Ousey and Mo Birch there are tunes like “Changes”, “Back to Earth”, “Lights Burned Out” and the epic “Wild Swan”. They sound good and are played well by some really impressive musicians, but it just isn’t Magnum. The highlights are Kingdom of Madness with the original flute intro by Richard Bailey, and of course “Scared Hour” with that epic keyboard intro. Tonight’s headliners need no introduction…. The Wildhearts with their sometimes turbulent and unpredictable history are back together, treading the boards once again with their own brand of genre-punching Rock. They kick off with “I Wanna Go Where the People Go” and here starts about 90 minutes of solid entertainment worthy of their headlining status. Ginger’s Geordie sarcasm pretty much fills the in-between song banter as the band power through songs like “Vanilla Radio”, “Sick of Drugs” and the hard-hitting “Greetings from Shitsville”. That end’s the second day of entertainment and to say at just 49 years old I am shattered is an understatement, a good night’s sleep beckons to keep my energy up for the final day. After a wonderfully refreshing sleep in one of the lovely onsite Woodland Chalets and plenty of coffee; I am back in the main hall – regenerated and ready for the final 10 bands. The first of these is Wicked Stone; a four-piece band who have the unenviable task of warming everybody up at 11am on a Sunday morning, while most people are still in bed or at church. They certainly give a good account of themselves and do their best to get everything started. Lead singer Joe Hawx is all over the stage, powering through some nice vocals while accompanied by the huge sounding James Forrister on guitar. Their set includes the blistering “Ain’t No Rest” and “Set Me On Fire”, mixed with some of AC/DC’s “Whole Lot a Rosie”. 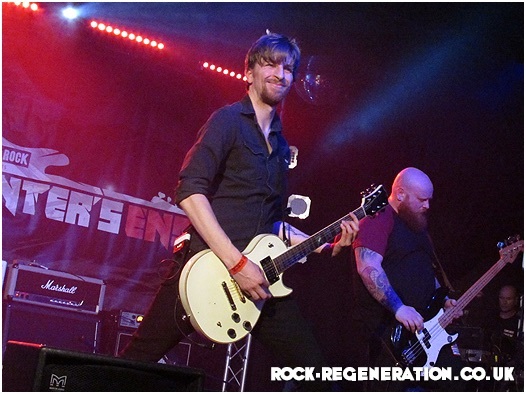 As the band take the applause at the end of their set; singer Joe removes his dark glasses and gives a smug grin, knowing they nailed their set. Hollowstar are a very popular addition to this line-up and despite it only being midday, a huge amount of people crowd into the main hall to see them perform. They not only play one of the sets of the weekend but they are mightily humbled by the support from their fans; there is even a marriage proposal during their set, and thankfully there is a positive response. “All I Gotta Say” gets a great chorus sing-a-long and before “Let You Down” frontman Joe Bonson tells the emotional story of a good-natured friend who passed away before the band got their first radio play on Planet Rock. Indeed a great set from a band who seem to have a very bright future. The next band Dante Fox had me torn between two of my great passions. Clearly I love my music as I would not be writing this; secondly, I am a huge Liverpool FC fan and their game against Burnley was being shown on the big screens in the bar area. As the band came on stage I watched them perform Young Hearts with vocalist Sue Willets giving a good accountant of herself, with some nice melodic guitars from Tim Manford. I then drift away to see Liverpool put four past Burnley in a great 4-2 victory. Next up is Fahran, they are a band who like Hollowstar have a good deal of followers and are an emerging band to keep a close eye on. This month they are off on tour with Skarlett Riot and release a brand new single. Though the band play material from their debut album “Chasing Hours”, they have much more focus on their new and soon to be released follow up “Vapours”. From the new single “Pyre” which they play with plenty of energy; you can hear a new heavier sound emerging, showing a new chapter for the band. I’m still in a celebratory mood after the Liverpool win and am pleased to catch up with a band I’ve seen before called “Departed”. An exciting live band who feature the great pairing of Mark Pascall (Morph; Empire of Fools) and Ben Brookland (The Treatment) who together have formed a great songwriting partnership. This afternoon they are on top form and hit the stage with huge smiles on their faces ready for their 30 minute set. They energetically perform tracks from the new EP “Tides”, as well as a couple from the debut including the infectious “Pretty Little Thing” and “Superstitious”. Their thirty minutes stage time is just not enough for the crowd and many are pleading for more as they leave the stage triumphant. So that’s the first five bands done – once again we now have a two hour break for a welcome rest; so I’m off for a cup of tea, a digestive biscuit and a short siesta. The evening starts brightly with Amy Montgomery who once again flies the flag for Northern Ireland. The compere Darren Reddick said that she has been compared to her idol Alanis Morrisette and Janis Joplin, however when she starts singing I hear more of a Patti Smith-style than anything else. What I love about her is she ignores trends and follows her heart, performing in a very different way to anyone else. Her voice is powerful and has an extensive range, while she swaps between guitars and keyboards to deliver a set full of individual tunes with a passionate delivery. Amy and her band perform some great tunes like “Meet You in the Sun”, “River of Compassion” and the very distinctive “Tree Song” featuring some lovely bluesy guitar. The last number featured a truly remarkable and entertaining mash-up of The Beatles “Tomorrow Never Knows” and Donna Summer’s “I Feel Love”. Certainly an artist to keep a close eye on, hopefully she will be touring sometime soon. The best named band of the weekend has to be Henry’s Funeral Shoe, quite random but very original. The band features two brothers from South Wales, Aled Clifford (Guitar/Vocals) and Brennig Clifford (Drums) who together deliver some heavy down and dirty blues. At times they are traditional but the majority of time they go off-piste and take the audience on a journey of discovery. For a two-piece they make one hell of a noise which includes tunes like “Janice the Stripper” and the brilliant “Empty Church”. which starts with some atmospheric Ebow then progressing to some creative slide work. Aled’s hilarious Welsh humour and in-between song banter is drier than an Arabs Sandal and raises plenty of laughs while he tunes up his guitar. 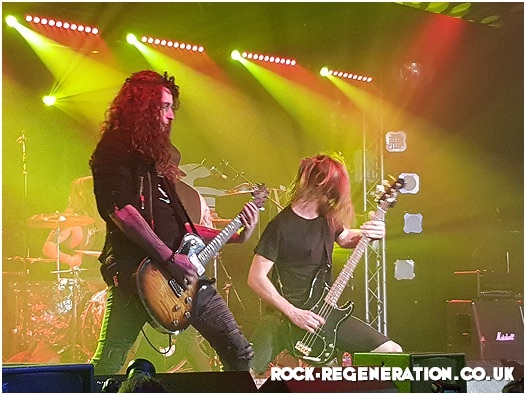 The multi-nationality Eden’s Curse take to the Winter’s End Stage next and once again are something completely different, with a band who deliver melodic progressive Metal. After their slightly sinister fairground-style intro music the five-piece power through a great set full of uplifting songs, that reach into the very depths of their musical style. Mixing Christian Pulkkinen’s creative synthesisers with Thorsten Koehne’s prominent electric guitar work, together with their spot on rhythms and Nikola Mijic’s vocals the band make an epic atmospheric sound which is enjoyed by the appreciative audience. Their set features “Masquerade Of Love”, “The Great Pretender” and “Unbreakable” which is dedicated to the late Ted Mckenna who found fame drumming with Michael Schenker Group, Rory Gallagher and The Sensational Alex Harvey Band. 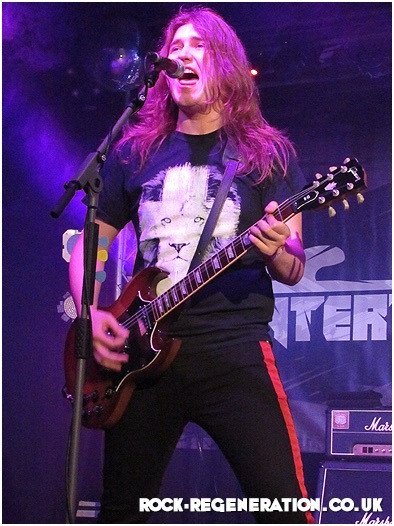 The band also manage to squeeze into their short set the monumental “Angels & Demons”, a song that is based around the Dan Brown novel of the same name. The penultimate band of the evening is the Kris Barras band who themselves have been getting plenty of radio play on Planet Rock with tracks from the recent album “The Divine & Dirty”. I must confess I am only a recent convert to his style of music and sadly missed him when he played locally in Bournemouth recently. After listening to the album there is somewhat of an unpredictable draw to the music. This increases when you see them perform live; with quite a simple set-up of one guitar, keyboards, bass and drums they create such a brilliant sound. Kris has the audience in the palms of his sweaty hands with a host of great tunes including opener ‘Rock n Roll Running Through my Veins’ and a rather tasty cover of the Led Zeppelin classic ‘Rock N’ Roll’. It’s difficult not to shed a tear during the emotional “Watch Over Me” where Kris dedicates the song to his late Father, who was a huge instigator of his musical career. The set ends with “Hail Mary” with a glorious audience sing-a-long ending possibly one of the best sets of the weekend. And so to the final band……. Tonight’s headliners Reef who bound onto the stage with the energy of men half their age. Looking like they have come from a day’s surfing, they all seem fighting fit and ready to entertain. 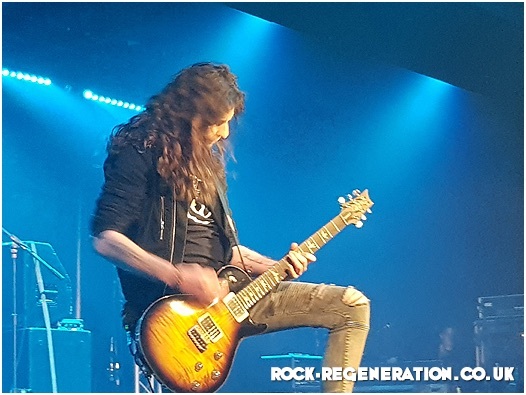 They open with “Naked”; as the instantly recognisable bass and guitar kicks in, the audience start to move with frontman Garry Stringer looking delighted with the great crowd reaction. To be honest I would have doubted Reef would have been the right band to headline an event like this, but I am happy to be proved wrong with a stunning set full of great tunes from throughout their illustrious career. With tunes like “Lone Rider”, “I’ve Got Something to Say” and the ever popular “Place Your Hands” the band leave the stage triumphant after a fantastic 90 minute set. So what a fantastic weekend was had. 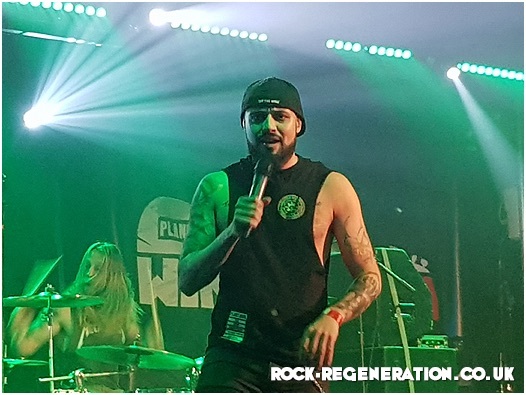 So much praise needs to go to Planet Rock’s Jon Norman and his incredible team for putting the event together; making sure that all the timings work and delivering a near perfect sound, which they did. It’s hard to please everyone and over the weekend I heard a few grumbles about the line-up being a lot weaker this year. I would disagree as the line-up was stacked full of great bands that delivered in all areas. Personally I would only make a few slight changes, but that is only down to a matter of personal taste. 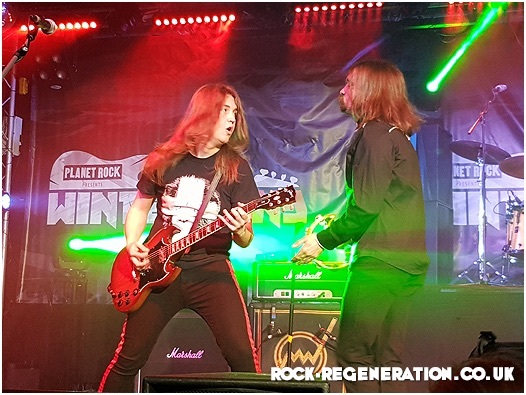 Long live Planet Rock who are still against all odds fighting the fight to promote Rock and Metal in the UK …from this angle they are winning by a country mile. More Videos can be found on our Youtube page here.